I’d say this tweet sums things up pretty well as far as Donald Trump and Kim Jong-un go. There are some definite similarities, and not just the bad hair and total disregard for the people of their respective countries. No, what really strikes me is how they both try to mythologize themselves, and build themselves up as naturally better than other people. In Jong-un’s case, this didn’t start with him; it’s his father about whom most of these seem to have originated, although some have been passed down. 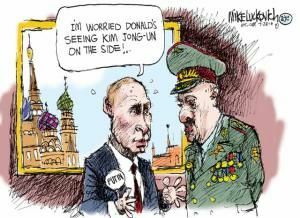 Both of are said to have learned to drive at the age of three, with Jong-il also reported to have learned to walk and talk prior to the age of six months. 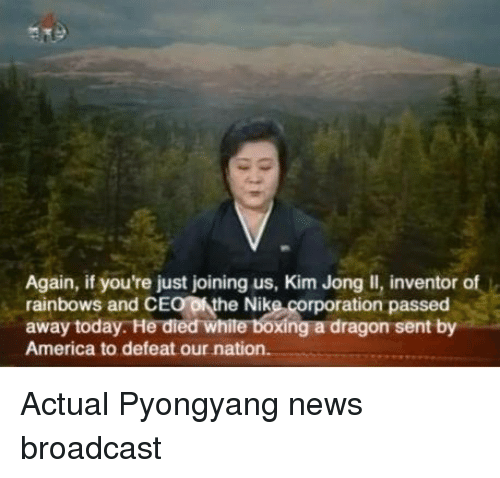 Jong-il was born on a sacred mountain, and his birth was marked by a double rainbow and winter changing to spring. 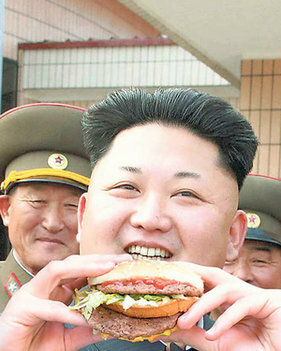 He’s even credited with inventing the hamburger (which he called “double bread with meat”; I’m not sure whether that loses something in translation or he’s just bad at naming things), so I have to wonder how Wimpy in the Popeye comics and cartoons was conning people for them before Jong-il was born. Also, he never needed to use the bathroom, which could explain why he was so full of crap. Trump’s myths aren’t quite so bizarre, because the United States isn’t as isolated, but he certainly seems to be going in that direction. He claims to have been the greatest baseball player in New York, but you couldn’t make any money doing it then. 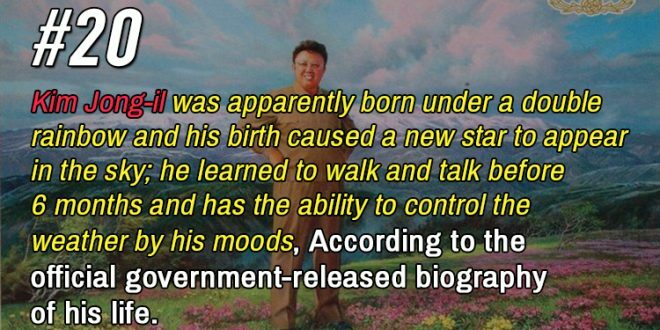 That sounds kind of like how Jong-il says he was the best golfer ever and a fashion icon, and Jong-un a skilled composer. Not that I can see how any of these things relate to skill in leadership or diplomacy, although I guess not having to urinate would mean more time to devote to your job. I’ve mentioned before how Trump seems to think he’s naturally talented at just about everything. According to him, he’s genetically predisposed to be a businessman and negotiator. At one point, he backpedaled after saying he learned a lot about negotiation from his father, insisting that it’s an inborn skill that can’t really be learned, and that of course he has it. And remember when he claimed that the rain stopped as soon as he started his inauguration speech, which was wholly untrue according to eyewitness testimony? Well, guess what, controlling the weather is another power with which the Kim family is credited. Actually, I seem to recall people blaming Obama for a hurricane, so maybe some Americans just think that’s part of being president. It must be hidden somewhere in the Constitution. And apparently some people actually believed the Alternative Fact about the huge turnout at Trump’s inauguration, so I guess he’s on his way toward a Kim-style cult of personality. This kind of thing was common back in the day when kings traced their descent directly from gods, but it seems weird nowadays. Has Vladimir Putin been credited with any miracles yet? Let’s hope somebody in the world has the power to neutralize nuclear warheads. 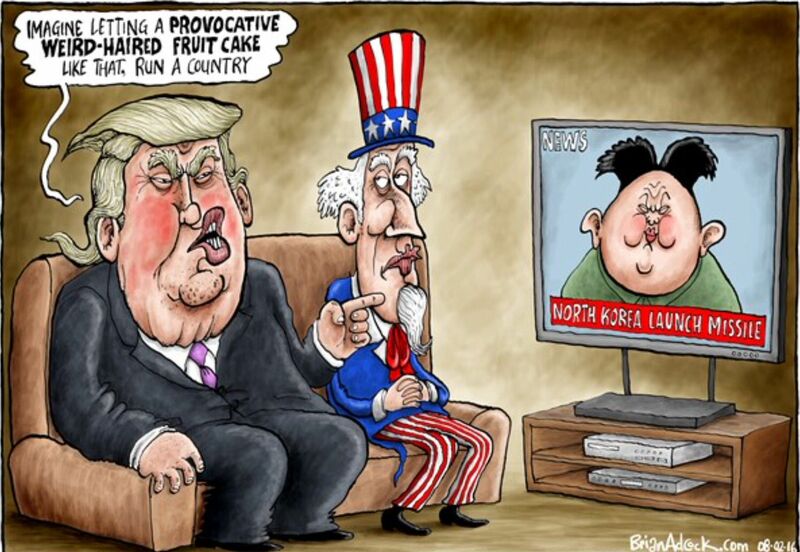 This entry was posted in Current Events, Magic, Politics, Snobbery and tagged cult of personality, donald trump, kim jong-il, kim jong-un, miracles, north korea, talent. Bookmark the permalink.